← Ritter Sport with Strawberry Creme….mmmmmm…. Tonight I checked into the Davenport Hotel in Spokane, Washington (more on this fabulous place, a little later). I hadn’t eaten since before noon and my stomach was growling loudly. Now I’m too shy to go downstairs and eat by myself at a lonely table for one…so what do I do? I eat the complimentary peanut brittle, that’s what I do. If you know anything about me, you’ll know that I have to be pretty hungry to eat peanut anything. I have never cared for nuts of any kind. I force myself to eat almonds because they are supposed to be good for you, but with all the salted, roasted crust on them, I think I’ve canceled the positive health effects out….anyway, back to the brittle…. 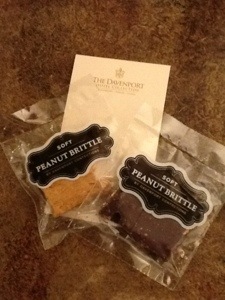 It’s a soft variety of peanut brittle and the hotel supplies 2 small bags on the side table. One bag is plain, and the other is chocolate coated. Of course I started with the chocolate, and wow, so smooth, next I tried the plain and it was salty and sweet, and perfect. My only complaint is that the bags are really hard to get into. 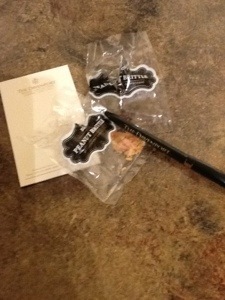 i resorted to poking them with the hotel pen. Much like the pusher says in those ’70’s movies “the first one’s free”, and now I’m hooked. They sell boxes of the stuff at the front desk, and you can bet some is going home with me. I’m not sure that it will make it home, though. I better put it in the trunk…even better, they are running a special through Valentine’s day, buy a pound, and get a half pound free! According to the Davenport’s guide, there are 6 people who create this confection for the hotel, as well as shipping it world-wide. They make over 150,000 bags of it a year, or about 22,500 pounds. 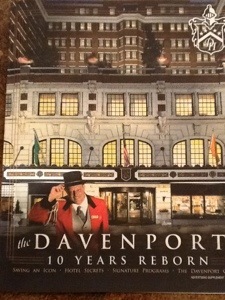 I have been fortunate to stay at the Davenport Hotel at least a dozen times in the past 5 years, and I have to say it is my favorite hotel of any place that I can remember staying. The beds are so comfy, the service and the food in the restaurants is excellent, and the cocktails are superb. The lobby is as grand as any great hotel, and their ballrooms have been restored to absolute splendor. It has a wonderful story of being the jewel of Spokane before falling into neglect. After years on the market and facing demolition, Walter and Karen Worthy stepped up with their own money and remodeled the hotel down to the studs. They brought it back to it’s original glory, plus built a sister hotel across the street. The hotel has spurred a downtown rebirth of Spokane. It really is a great story of a dream and success. In spite of it’s glamour, it’s dog friendly, too. If I were Eloise, I’d live here for sure! The hotel celebrated its 10th anniversary last year. Posted in crunchy, Milk chocolate, peanut, Peanut Butter, travels. Bookmark the permalink. Hmmm, I’ve never actually BEEN IN the Davenport… Maybe I’ll get Hubby to take me there for Valentine’s. And make him give me his share of the candy. You must go soon. They have great packages with dining credits.